I’m happy to know Kelly Luce from her time as editor-in-chief at Bat City Review (she was kind enough to publish a story of mine), and our work appears together in a rad anthology of flash science fiction called Gigantic Worlds. She’s also a Contributing Editor for Electric Literature. Luce has published a short story collection, Three Scenarios in Which Hana Sasaki Grows a Tail, and her stories appear in lots of places, including Electric Literature, Crazyhorse, and The Southern Review. Most recently, we’ve spotted her work in Catapult’s anthology, Watchlist: 32 Stories by Persons of Interest. 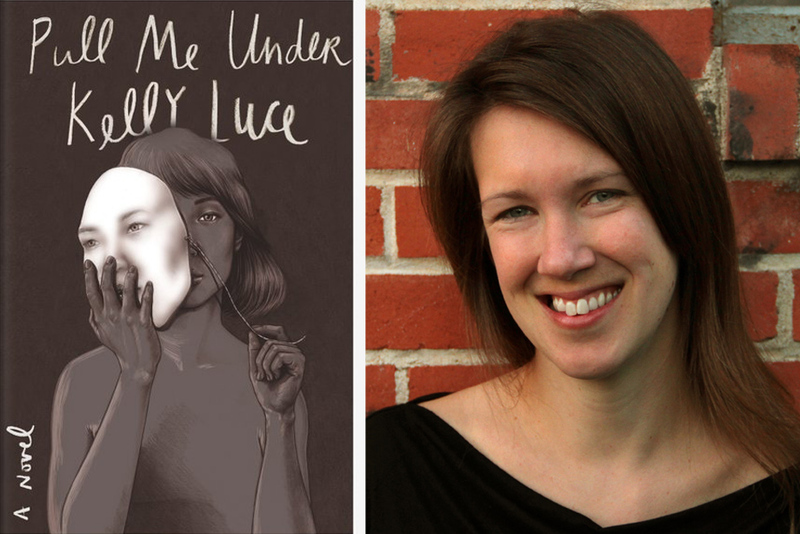 Her novel, Pull Me Under, comes out on Nov. 1, 2016 from Farrar, Straus, and Giroux. In the spring of 2010, she lived in Orlando as a Kerouac Project Writer in Residence, where writers get to live in the Kerouac house in Orlando for three months. I interviewed Luce over email about her time in Orlando, and discovered her storied Florida past, from paddling the Miami canals to biking past gators in the Everglades. She gets it. Rebecca Evanhoe: Did you have a a strong Florida connection before your Kerouac residency? Kelly Luce: I did. My grandpa’s job transferred him and my grandma to Clearwater when I was little, and until I was a teenager, Florida was the only state outside of Illinois I visited. My dad and I would fly down with a thermos full of Italian beef and fly back with the thermos full of fresh OJ. Life there seemed so luxurious and exotic. Lizards, palm trees, crab grass, white sand beaches, alligators on the playground, causeways, coconuts. Trips to Tarpon Springs and the requisite sponge-buying became an inside joke. We took a few trips to the Keys and the Everglades, where you can rent bikes and cycle past the gators lining the road. I also lived in Miami for a year, for an MFA program I ended up dropping out of. There were three hurricanes that year. My apartment was infested with termites and had a rat living under the sink, but manatees swam in the canal behind the complex and you could feed them fresh water from the hose. As you know, Miami’s canals are its alleys; my boyfriend and I bought a $30 inflatable raft and would paddle from our apartment through the brackish water all the way to the beach. People thought we were crazy. On the way out of Florida, that boyfriend and I spent a month WWOOFing [World Wide Opportunities on Organic Farms] near Alachua, up north, which had great tannin-rich springs that looked like you were swimming in Pepsi. One other very Florida story from that year is that I met up with my ex-fiance at an IHOP off the turnpike to return my engagement ring. My ex and I planned to catch a spring training game at Osceola County Stadium afterward, but it was rain delayed. We sat in the car and ate peanuts and drank sour apple Smirnoff Ices and reminisced. Then it got sad and I left. On the drive home I had to keep pulling over because it was that kind of Florida rain where it’s pouring so hard the wipers can’t keep up. Billy Collins mocked my flip phone—the highlight of my writing career to this day. RE: Tell us about your time living in Orlando, and in Kerouac’s house. Did you see his ghost? Did you enjoy Orlando? KL: I did commune with Jack, once, on the morning of his 88th birthday. The Kerouac house has a proper front bedroom and a converted back room that used to be Jack’s bedroom and writing spot; sometimes I’d sleep in the back on the single bed. There’s a large laminated cardboard poster of him leaning against the wall behind the bed. The morning of his birthday, I awoke just in time to see the poster tip gently onto me. I was okay with it. It was his birthday. I enjoyed the College Park neighborhood. Lots of good old trees, screened porches, and parks. I rode my bike to Lake Eola Park sometimes. I got to know Susan Lilley and Phil Deaver, both great writers, who live in pretty Winter Park. Once at a party at their house Billy Collins mocked my flip phone—the highlight of my writing career to this day. RE: As a writer in residence, did you venture out beyond Orlando? RE: Your story “Central Florida, March,” first appeared in an anthology, Tigertail: A South Florida Annual: Florida Flash, edited by Lynne Barrett. The title gives us a time and a place, and the piece contains a string of images that are perfectly specific to that place—Publix, the way the leaves stay on the trees without falling, the snakebird. Tell us about how this short fiction piece came about. Did these images accrue during your residency, or did they appear all at once? KL: The images accrued. I liked hanging out at Lake Adair, watching the wildlife, and of course had to find out what was up with those anhingas, or snakebirds. They’re really awesome. They swim submerged except for their necks, but they’re not waterproof, so they eventually start to sink and have to get out and dry off. They’re so vulnerable when they dry their wings. There’s a huge granddaddy oak in front of the Kerouac House that houses, among other things, a secret letterbox. Sometimes people would come set their easels up in the street and paint the tree. The event that tied those images together for me was a visit my grandparents and a few other family members, who happened to be down in Florida, made to Orlando for a reading I gave. It struck me during that visit that they had become truly old. RE: Were you a Kerouac fan? KL: I learned a lot about Kerouac in Orlando. I had only read On the Road once, years before, so it was great to meet people who really knew their Kerouac history and could tell stories and illuminate his personality and bring him to life. He meant a lot to so many people. RE: How else did Florida snake its way into your writing? KL: Because of that experience I decided to make one of the characters in my novel, a wandering failed student (ronin in Japanese) a Kerouac aficionado who carries around a copy of On the Road in which nearly every sentence is highlighted. I also wrote a story set in central Florida about a guy who steals dead bodies from a parade and takes them to Disney Land. It’ll be out in the next issue of The Austin Review. RE: Are there other Florida writers that you’re drawn to? KL: Joy Williams, Laura van den Berg, Patricia Engel, Carl Hiassen, and John Dufresne all come to mind. Jeff Vandermeer‘s wonderful Southern Reach series captures the weird surreality of the Florida of my childhood imagination. Jennine Capó Crucet’s novel Make Your Home Among Strangers should be required reading. And you! Your stories are so good. Rebecca Evanhoe was born in Wichita, KS. She earned a BA in chemistry from the University of Kansas, and an MFA from the University of Florida. She writes short stories and creative non-fiction, and her work appears in Harper’s Magazine, Gulf Coast, Vice, Gigantic, Bat City Review, and elsewhere. She lives in Gainesville, FL.